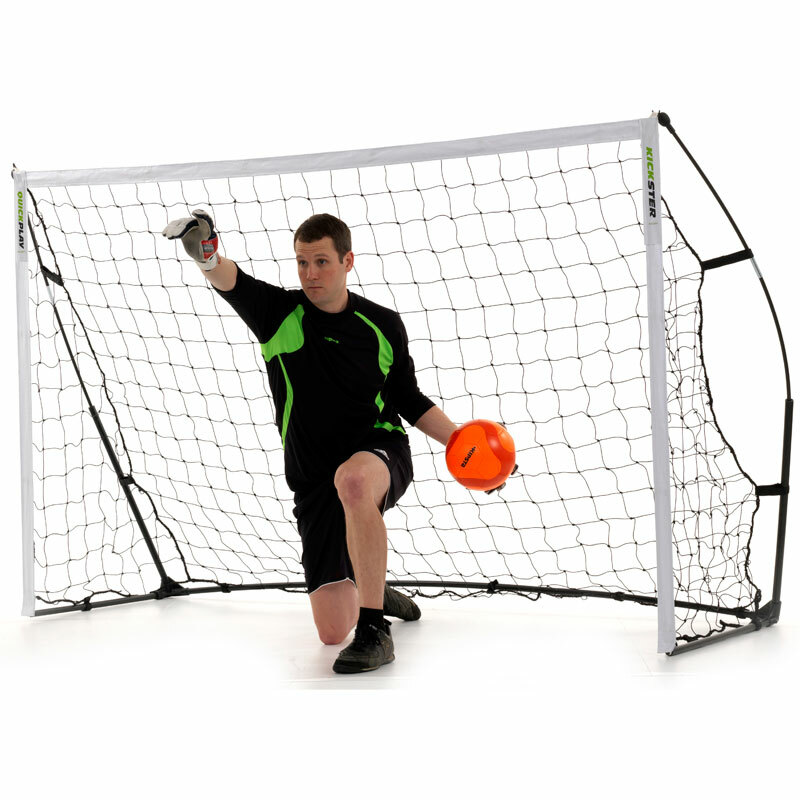 The Quickplay Kickster Academy 8ft x 5ft Portable Football Goal is for junior football (ages 12 and under). Forget the frustration of filling up the whole back seat of the car with one goal. This is a truly portable goal, which can be used anywhere, in the garden, park, playground, beach or wherever. The perfect size for social games and garden family fun. Quick & easy to assemble in 2 minutes or less - no need for an instruction manual. Features QuickPlay's patented robust flexi-post design - tested to British Standards BS-EN71. Unique longer-life net bungee attachment system. Includes grounds stakes and a compact carry bag with shoulder strap. Assembled size - L 244cm x H 150cm x D 80cm (8' x 5'). Packed Size - 96cm x 19.5cm x 11.5cm. Really happy with the Quickplay Goals we bought. We took 4 individual 8x5 goals and the quality is first class. They are sturdy enough for our weekly training sessions with kids U8 and below. Takes a couple of minutes only to set up. We intend to buy some more for the bigger kids. Recommended. This is an excellent product purchased from a very professional company. I am always dubious about purchasing from places I have never heard of, but being the cheapest company selling these and on a budget I decided to give it a go. The kids love them and they add a little more realism into the training sessions. Easy to put up and just as easy to take down. Excellent sturdy storage bag and will definitely purchase from newitts again. Great product easy assembly it really does take minutes to set up. Great design and sturdy nets. My 3 kids just love it. 4 out of 5 kickster goal- result ! My son got this from santa claus, so easy to put up and take down that his mum has done it ! Goes back in the bag when not in use quickly and easily. The bar and posts are fabric so ball not going to bounce of them, but benefits to us ,limited space for storage and its portability more than compensate. got two of these goal posts for my sons birthday.cant fault them,quick and easy to assemble,and dismantle.handy storage bag supplied.good quality item. 5 out of 5 No more jumpers for goalposts! Tried this out for the first time at the weekend. It was a 2 mile walk to the park carrying the packed goal - not very heavy, though I was grateful for the shoulder strap. Given that it was the first time I had set it up, it took a 4 minutes rather than the advertised two, but that was just me taking my time. Awesome fun and we had envious looks from other lads having to make do with two bikes for posts. Well worth the money.